Easy to use diary app. Is there a better alternative to Memories? Is Memories really the best app in Word Processing category? Will Memories work good on macOS 10.13.4? 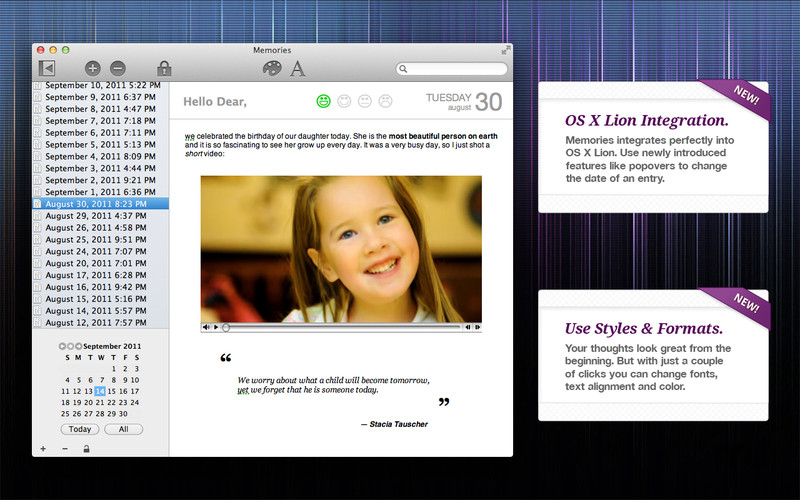 Memories is the easiest to use diary app for OS X. 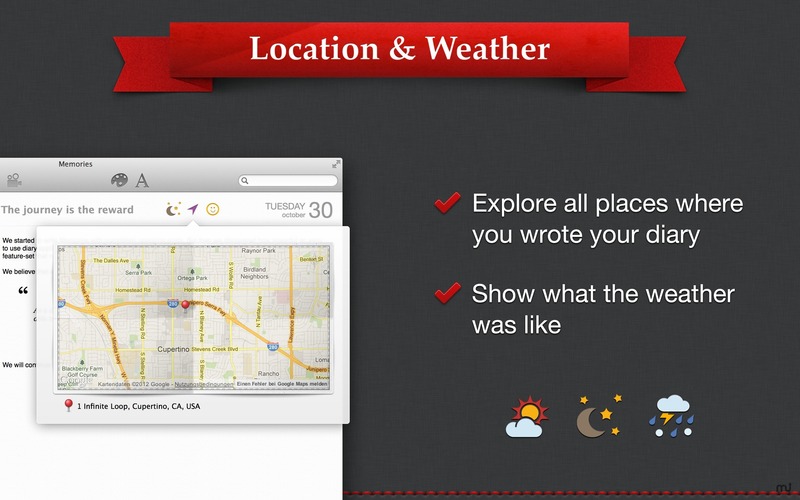 Write a journal, include images, videos and sound. 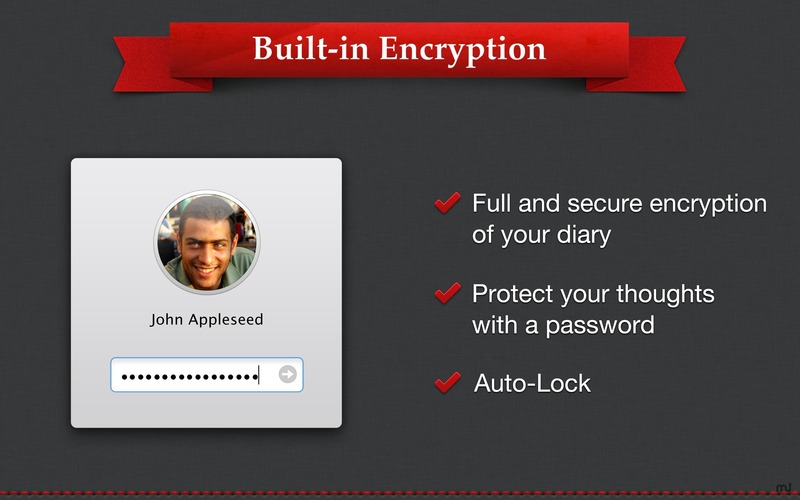 Keep your diary at one secure place and browse through your precious happenings. Rediscover the greatest moments in your life. 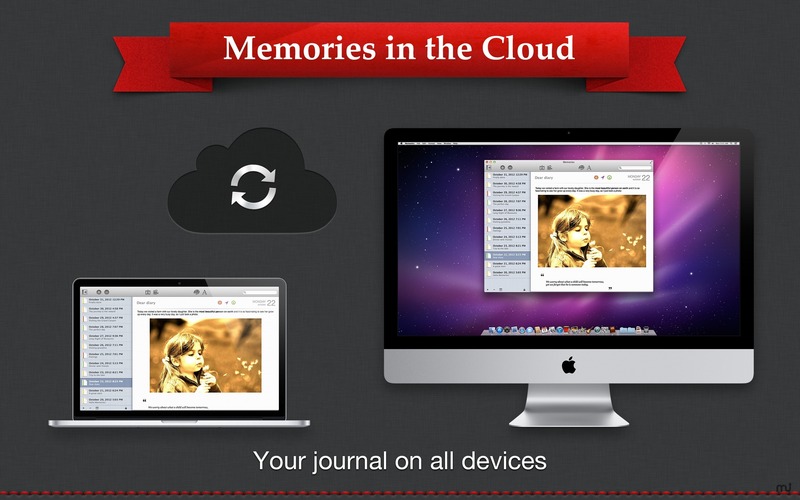 Sync your journal over iCloud. Weather & location for new entries. Old entries will automatically update when you select them. There is also a new menu item in case you want to manually update both. Take a photo or video with your iSight camera without leaving the app. Export in a variety of formats: Portable Document Format (.pdf), Rich Text Format (.rtf), Rich Text Format With Attachments (.rtfd), Web Page (.html), Web Archive, OpenDocument Text (.odt), Word 2007 format (.docx), Word 2003 format (.xml), Word 97 format (.doc) and plain text (.txt). 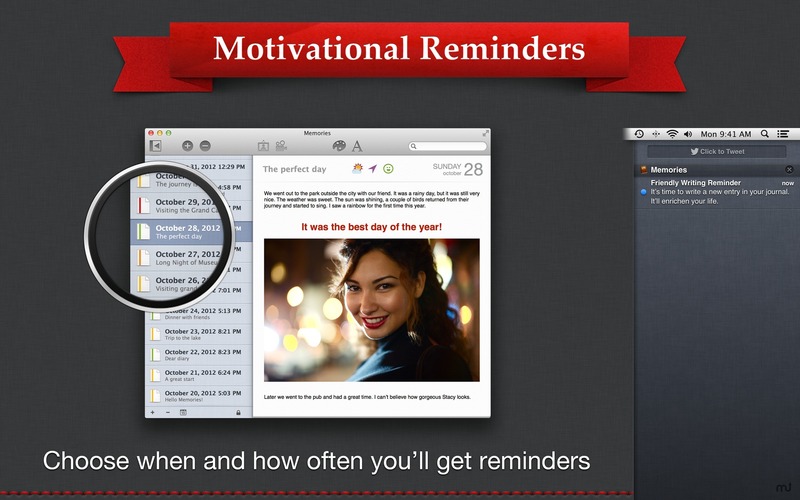 Notification Center support for writing reminders. Added auto-lock feature. By default Memories locks itself in 5 minutes after the window was closed. Preferences for a default font, auto-lock timer, Notification Center and weather. Memories now requires OS X 10.7 Lion. List view looks much nicer now and adds more information (date, title & mood). Change the date of an entry right from the top bar of each entry (or alternatively double-click in the list view or use the Edit menu). Memories is much faster now, because it doesn’t load all entries on launch. Instead it loads and decrypts just the selected one. Better memory management, support for new technologies. Moved date filter calendar out of the way into a popover. Added animations at several places for more pizzaz. Improved support of embedded sound & videos. The play buttons work now every time you click on them and you don’t have to right-click anymore. Every encryption key is now truly random. Greatly improved encryption code and security. Completely new login view with a hint in case you can’t remember the password anymore. Improved auto-saving on every major operation. Memories now informs you when no entry is selected instead of being completely blank. Error handling in several cases. Text no longer disappears when you change the mood without previously saving an entry. The insertion cursor should no longer jump every couple of minutes when you write more than a screen full of text. Search in the content of all entries. Fixed bug where password wasn’t recognized on certain older machines. Window should no longer be grey in some rare cases where the app was force quit and the window size preferences got corrupted. Entries from which you removed all content get properly saved now instead of reverting to the last non-empty version. Empty space between entries on print & export of the whole journal.